Carnival Cruise Line has revealed brand new features along with enhanced ones at its Carnival Vista unveiling located in New York and London on January 22nd. The upcoming ship has brought several surprises with new industry firsts at sea and exciting inaugural itineraries. There are several new features onboard the new class Carnival Vista and one of those is the Skyride. The Skyride will be an 800 foot suspended cycling track that is 150 feet above the ocean. Passengers can cycle around the entire sports area including the Carnival Vistas funnel. Guests will be able to also enjoy amazing ocean views. Nearby is the SkyCourse with suspended ropes and a new indoor sports hangout area that includes various sports. The vessel will have the largest WaterWorks in the fleet and going one step further than previous ships. One of the most thrilling parts of this water park is the Kaleid-O-Slide where guests can hop on one or two person rafts and wiz around all the twists and turns that is 455 feet. The first ever three deck IMAX theater will be featured on the Carnival Vista where guests can watch all the latest movies that are released. Next door is also the Thrill theater that offers guests a multi-dimensional special effects experience. Both theaters are part of the ships Carnival Multiplex space. Featured on Carnival Vista and a first for the fleet will be the New England-inspired Seafood Shack, a casual indoor/outdoor dining venue near the Lido Marketplace eateries. This seafood-lovers’ paradise will feature a menu full of delicious, fresh favorites available for purchase. At the RedFrog Pub, Carnival will brew up great beer for good times in its first ever brewery. During each sailing two giant glass kettles will create tasty ales and lagers that can be enjoyed on tap from the bar and through unique tabletop taps that allow guests to pour their own beer. The full bar will also offer an array of Caribbean-inspired cocktails, beers and rums. Indoor/outdoor seating, live music and brewing tours and tastings will also be offered in this fun venue. 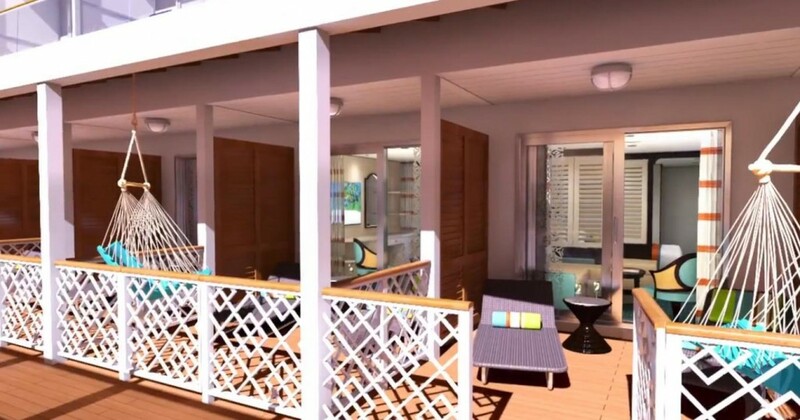 The Carnival Vista will have new Havana Cabana styled staterooms that have their own patios that also feature lounge chairs and a Hammock. They will face out towards the Havana area with easy access to the Havana bar and pool. This would be the perfect cruise ship to send to Cuba in the future with all its inspirational Cuban features. Carnival Vista will have all the very latest FUN 2.0 dining venues including Guys burger Joint and BlueIguana Cantina along with several others. The vessels two main dining rooms will be enhanced with a modern style. The Horizon dining room will even have a bar so that guests can meet and mingle. Thanks to an expanded Lanai on Deck 5 guests can stroll or sit and enjoy a beverage at one of the many dining and bar venues that will now feature outdoor areas. The Fahrenheit 555 Steakhouse, Bonsai Sushi restaurant, Library Bar, RedFrog Pub and stylish Havana Bar will all have outdoor seating. Cherry On Top which has been a passenger favorite since the FUN 2.0 upgrades is going to be expanded with new offerings and outdoor seating. The Carnival Vista Atrium won’t look like other ships in the fleet mainly thanks to its two large LED Towers that rise up to the top. 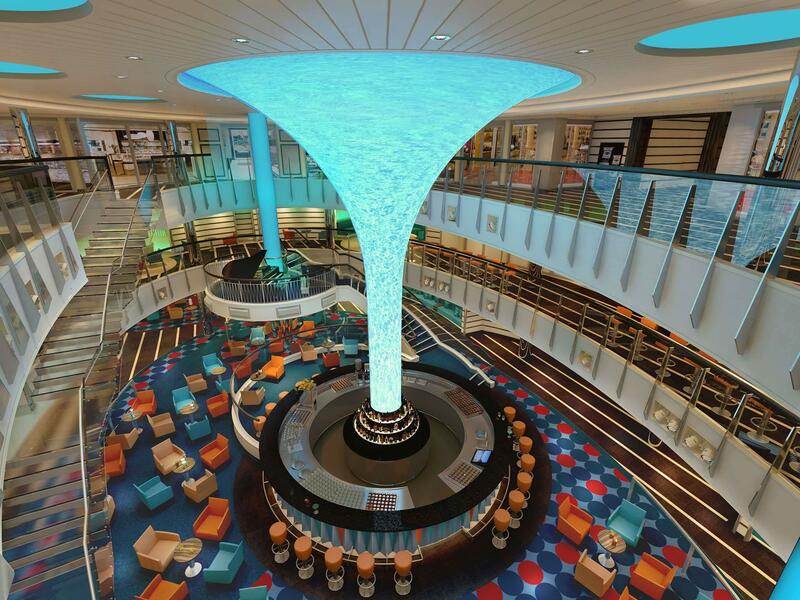 They will change the atmosphere of the Atrium which is the hub of the Carnival Vista. 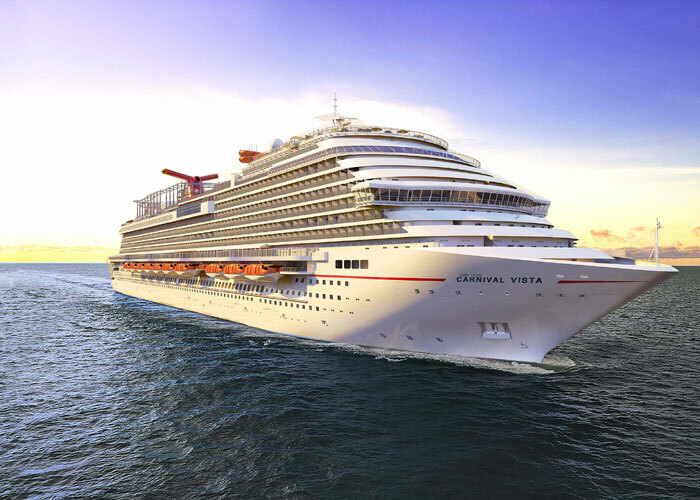 The largest ship in the fleet, Carnival Vista will measure 133,500 tons, 1,055 feet long and have a guest capacity of 3,936 (based on two per cabin). The new vessel will debut May 1, 2016, with a 13-day cruise departing from Trieste, Italy — the first European voyage for Carnival in three years. A variety of spectacular Mediterranean itineraries will be offered with port calls throughout Italy, France, Spain, Croatia and Turkey, as well as several new destinations for Carnival such as Crete (Heraklion), and Corfu, Greece; Valletta, Malta;Palermo, Sicily; Cagliari, Sardinia; and Gibraltar. On October 21, 2016, Carnival Vista will embark on a special 13-day transatlantic crossing and arrive in New York November 3, 2016, then operate a series of voyages from the Big Apple. Carnival Vista’s European cruises are currently available for reservations. Additional information on the New York departures will be available next month.